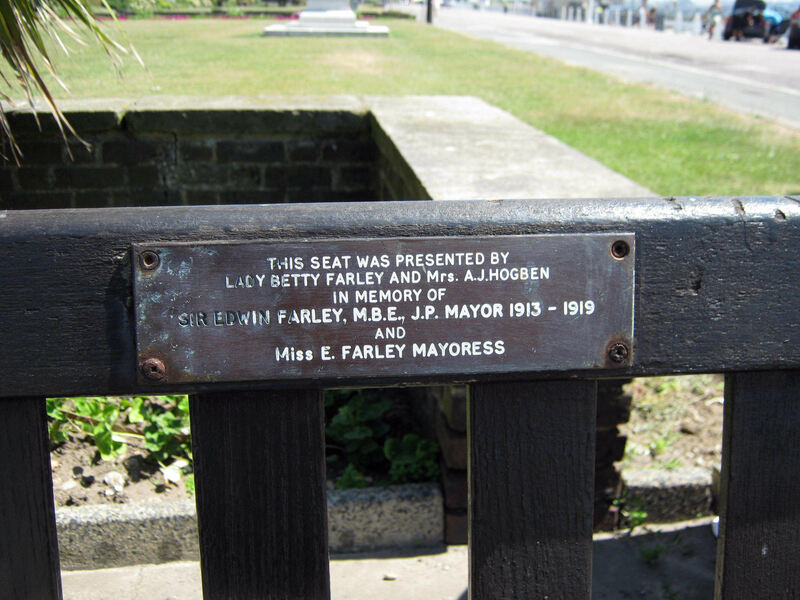 In Wellesley Road, near Dover’s seafront there is a seat dedicated to Sir Edwin Wood Thorp Farley. An appropriate place, for nearby once stood the Dover Patrol Hostel that Sir Edwin established. This was destroyed during World War II. Sir Edwin, a Dovorian, was born in 1864 and started work at the age of 10 in his father’s pork butchers shop, in the Snargate Street area. Like many local lads, he went to sea as soon as he was old enough and it is reported that he made 22 voyages to India and a further 11 to China. Becoming a landlubber when he was 22, Edwin joined his brothers in running the family dairy in Townwall Street. Eventually Edwin took this part of the business over and ran it with the help of his mother and sister, all of whom, lived on the premises. 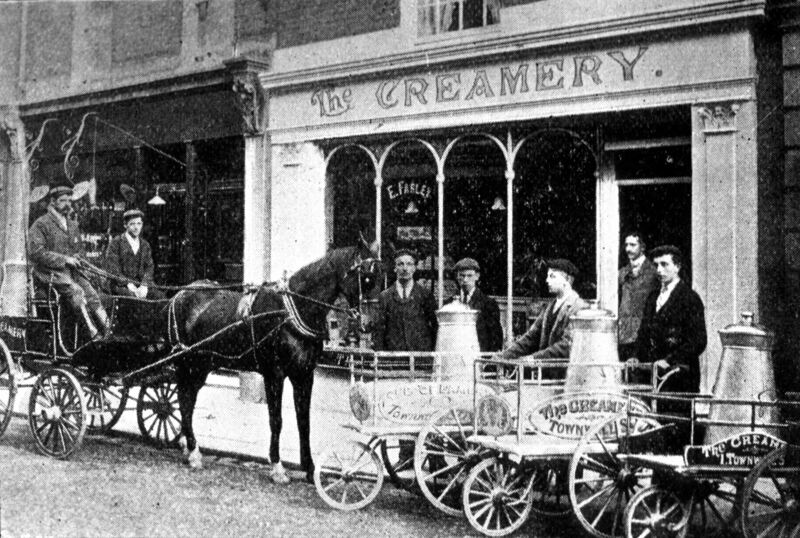 Following World War I, Edwin merged his firm with Woodhams to become one of Dover’s leading dairies. Socially, Edwin was a member of the Cinque Ports Artillery Volunteers until suffering a back injury that was to remain a problem for the rest of his life. He was also a mason through which he became involved in local politics. In 1903, he was elected the Master of the Peace and Harmony Masonic Lodge and Conservative councillor for what became Hougham Ward (Folkestone Road/Maxton and Elms Vale). At the time, Conservatives, under Sir William Crundall, dominated the council but there was a groundswell of Independents. In February 1913, Dover Harbour Board, whose Chairman was Crundall, filed a Parliamentary Bill to make changes to the Tidal Basin at the Western Docks. As a supplementary, consent was sort to replace the western half of the seafront and beach with a 5.75 acre dock and terminus for a Light Railway Company. This went down badly in Dover and a petition was raised followed by a poll that took place on 20 May 1913. Of those eligible to vote, 2,265 voted against the Bill’s Supplement and 1,508 for it and the Supplement was withdrawn. Edwin, already veering towards the Independents, firmly opposed the Crundall plan and he, along with two Conservatives, crossed the Chamber. This brought about a nearly equal division in the Council. In November 1913, Edwin was elected Mayor. World War I broke out on 4 August 1914 and the Borough of Dover, under the Defence of the Realm Act, was part of Dover Fortress. This meant that the military were in charge and although public elections were suspended councillors continued in office. 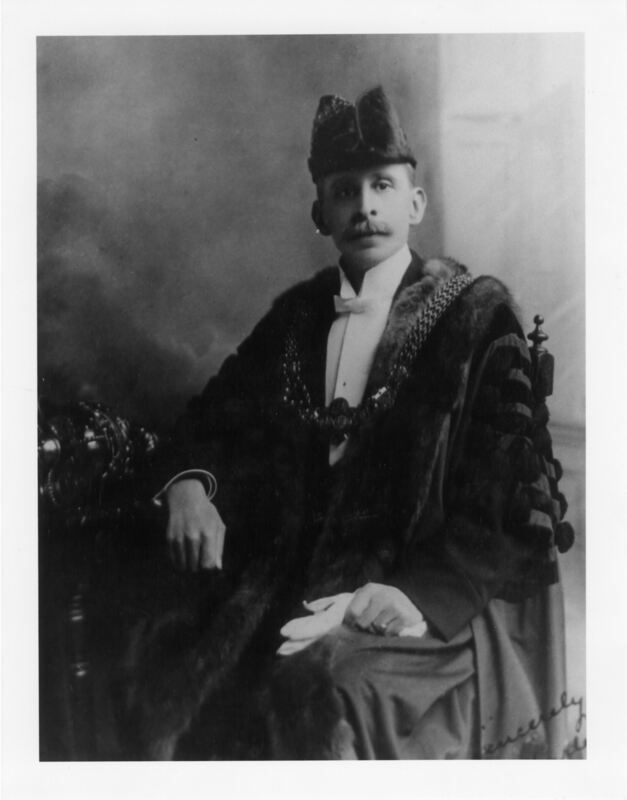 Edwin was re-elected Mayor by his colleagues in November 1914, 1915, 1916, 1917 and 1918! During this time, not only was Edwin responsible for municipal concerns with depleted staff, but also ensuring that the town’s folk co-operated with the Military Commanders. This included the billeting of servicemen, giving moral support to those about to embark to the Front and restrictions of movement. Movement restrictions meant the setting up and issuing of permits to local residents so that they could leave and re-enter the town. Food and fuel rationing was a responsibility of the council and also National Service registration when that was introduced in 1916. Dover, needless to say, was also in the front line – the first aerial bomb to be dropped on the United Kingdom was on 24 December 1914. It landed in the garden of Mr Terson of Leyburn Road that backed on to Taswell Street near where the Dover Society Plaque is today. Immediately air-raid drills were started and caves were turned into air-raid shelters. These included Trevanion caves (near the present swimming pool), oil mill caves, Barwick caves along Limekiln / Snargate Street and tunnels around both the Eastern and Western Heights. The police station, in the crypt of the Maison Dieu, provided shelter, as did the vaults of Phoenix Brewery, near Market Square. As the war progressed, caves were either opened or extended at Albany Place, Crabble Hill Road, Green Lane – Buckland, Winchelsea and Priory Hill, providing, in total, shelter for 2,000 people. During the war there were 113 raids and in all 184 bombs were dropped the heaviest weighed 600lbs. The town was also shelled twice from the sea. Edwin, as Mayor, was involved in dealing with the casualties of war, not only those in the town but men coming from the Front. The war victims of Dover’s civilian population were: 13 men, 7 women and 3 children killed. 36 men, 23 women and 12 children injured. From the Front, 1,320,149 sick and wounded were landed at Admiralty Pier. They were transported on through Marine Station – the medical symbol part of the frieze above what was the passenger entrance. Marine Station Passenger entrance, Note the medical emblem on left. There were also the sick and wounded from mining and submarine attacks, the explosion of the Glatton that killed 105 men and there was the Zeebrugge raid. Out of the 1,700 men who took part, 214 were killed and 383 were wounded. 156 were brought back to the Market Hall, where volunteers, supervised by Edwin, dealt with their mangled bodies.The total of Dovorians killed on the battlefields and at sea, was 1,400. On the lighter side, there was entertainment and fund raising. 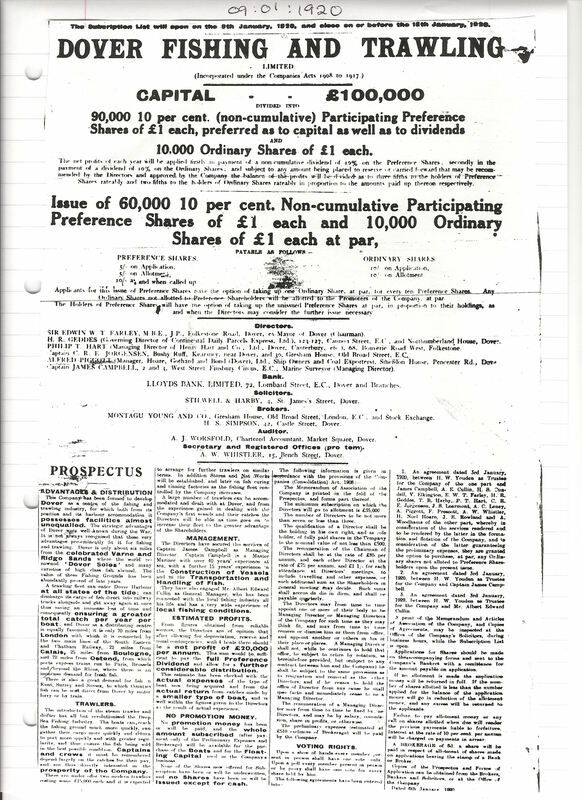 Edwin is credited with raising £120,000 for good causes related to the war effort. In 1916 Arthur T Benson, the Mayor of Dover, New York State, wrote offering help. 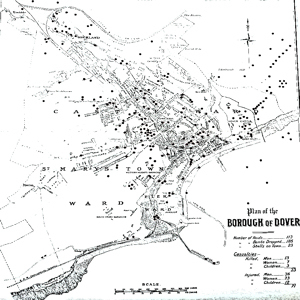 The subsequent correspondence established a link between the two towns, (See Daughters of Dover on the Dover Society Web site). Edwin, justifiably, became a national legend for always being on call and never once having slept out of the town. 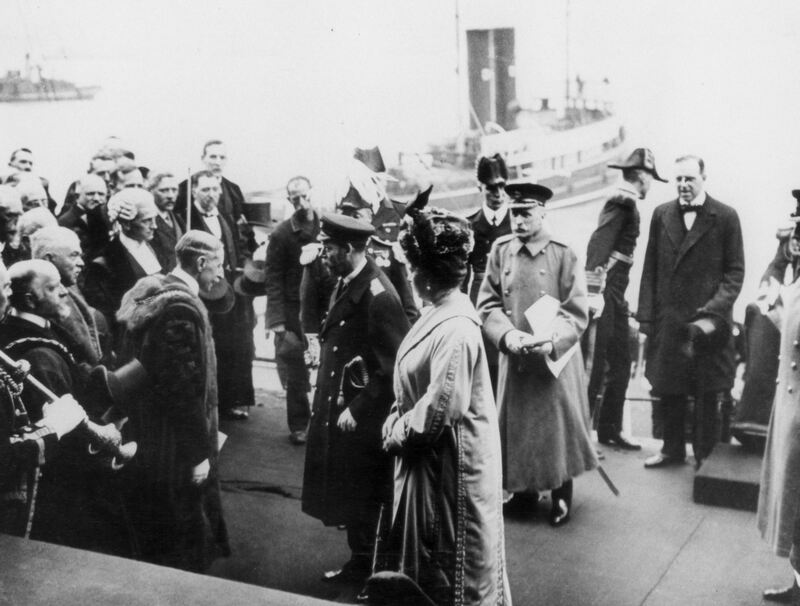 When King George V visited, in 1918, while Vice-Admiral Sir Roger Keyes was in command of the Dover Patrol, he thanked Edwin personally and awarded him the M.B.E. 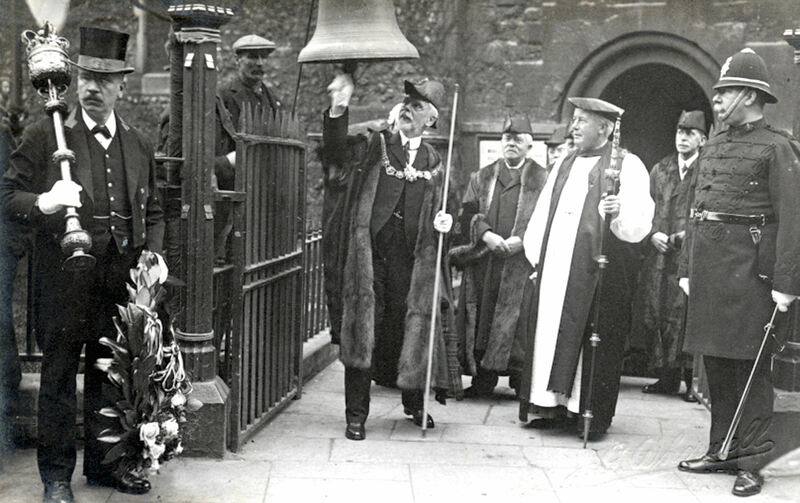 Before the war ended Edwin accepted, from Vice-Admiral Keyes, the Bell used by the Germans on Zeebrugge Mole to give warning of British attacks by sea and air. The King of the Belgians in recognition had given it to the town for the Zeebrugge Raid. 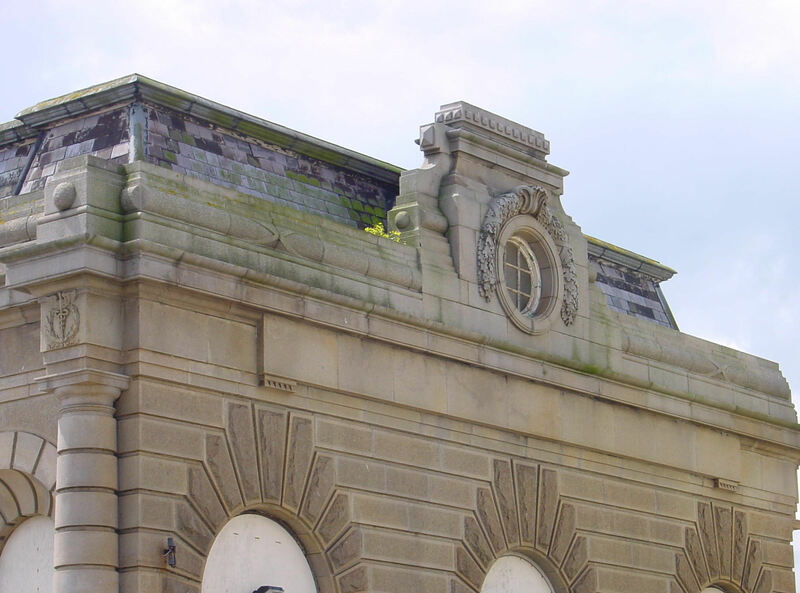 In 1923, it was placed in its permanent position on the front of the Town Hall, under a canopy. Edwin was knighted for his war services in 1920 and given the Honorary Freeman of the Borough. The certificate was enclosed in a casket of materials made from the Vindictive, one of the ships involved in the Zeebrugge raid. In November, he was elected Alderman and his home address was given as 25 Marine Parade. In January that year, Edwin had launched the Dover Fishing and Trawling Company in the hope of raising shares to set up a £100,000 capitalised company. The prospectus claimed that there were profits to be made from catching Dover Soles off the Varne and bringing them into Dover for onward despatch to fisheries. The venture failed, but he was successful in raising funds to erect memorials on the cliffs near Dover and near Calais to the men of the Dover Patrol. Initially, it was decided to erect large cairns but as the money poured in, nearly £45,000, the beautiful obelisks could be afforded. These were erected at Leathercote Point, St Margaret’s Bay, which was unveiled by the Prince of Wales on 28 July 1921, Cap Blanc Nez and New York harbour. With the money left over, Sir Edwin established a three storey Dover Patrol Hostel on Wellesley Road. Lady Keyes opened this well equipped establishment in July 1923. The following year, on 5 November 1924, saw the unveiling of Dover’s War Memorial by Vice-Admiral Sir Roger Keyes. 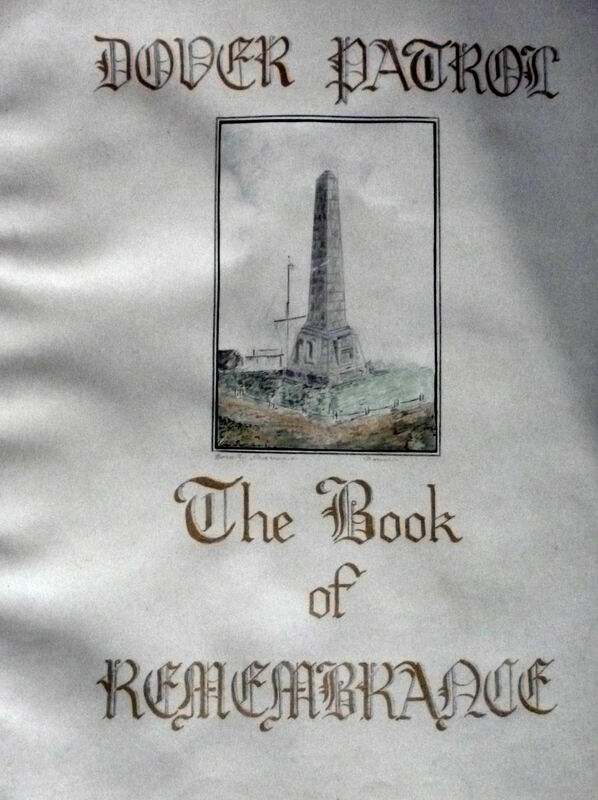 Afterwards the assembled dignitaries went to the Town Hall where Sir Roger presented Sir Edwin, the Dover Patrol ‘Golden Book’ – the Roll of Honour of the men who lost their lives serving in the Dover Patrol. Referred to as ‘Sir Edwin’ by young and old alike, he was considered kind and thoughtful and, by the end of the decade, living in retirement at 3 Camden Crescent. Often visiting his teashop in Bench Street for his afternoon ‘cuppa’, it was there that he met nurse Gertrude Elizabeth Clout from Elham. She worked at the town’s Royal Victoria Hospital. They married on 16 March 1933 and although Dover’s society were delighted, the national press had a field-day over the discrepancy in their ages – Edwin was 69 and Gertrude was 25! The couple moved to Shepherdswell, and they had one son named Roger in honour of Sir Roger Keyes. Before the year was out the nation was at war again and the following year saw the start of unremitting attacks on Dover that was to last four years. 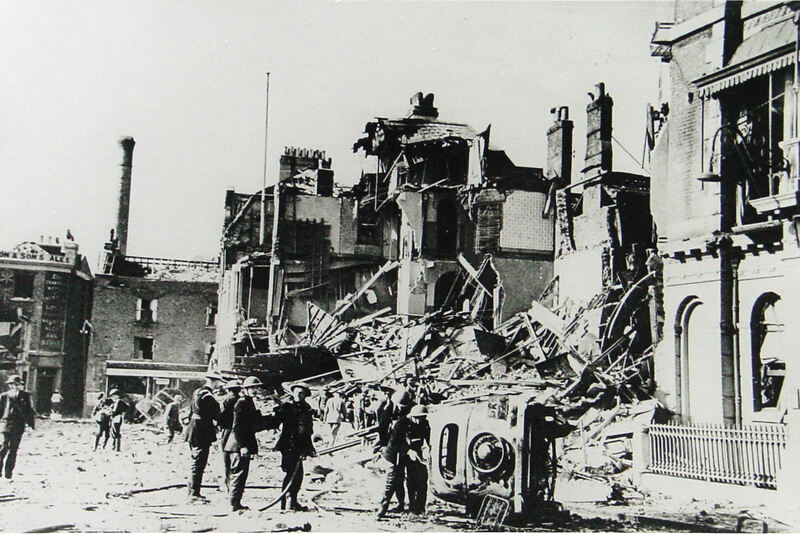 On Wednesday 11 September 1940, the town was simultaneously bombed and shelled and the Dover Patrol Hostel took the full impact of a large calibre bomb. Two men were killed and the building was completely wrecked. In memory, Sir Edwin’s seat was placed near the site of the hostel. Following the publication of this article, the granddaughters of Sir Edwin contacted Dover Town Council and me. The Mayor invited them to the Zeebrugge day celebration that is held each year on 25 April. I had hoped to meet the family that day but a Dover Town Council official stated that I was not to be allowed admission. This entry was posted in Armed Services, Camden Crescent, Farley Edwin - Mayor who stayed throughout WWI, Farley Edwin - Mayor who stayed throughout WWI, Farley Edwin - Mayor who stayed throughout WWI, Local Government, People. Bookmark the permalink.